HORNSEA POTTERY - BRONTE PATTERN; SUGAR BOWL. Dispatched with Hermes Tracked. 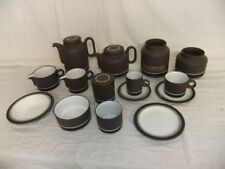 Fully back stamped with Hornsea Pottery mark and are first quality pieces. Buy It Now to add these beautiful pieces of English pottery to your tea table. A great retro Hornsea jar. Stamped to the base (see photo). 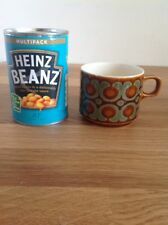 A rare Hornsea Pottery mug. Stamped to the base (see photos). If collecting in person cash is preferred. Lancaster Vitramic. Hornsea Pottery Contrast. X4 Breakfast / Dessert Dishes. Just to confirm you will receive 4 dishes all identical. Hornsea Heirloom Blue Set Of Vintage 1960s/70s 6 Spice Jars In Wooden Rack. Ginger, Cloves, Peppercorn, Allspice, Nutmeg and Cinnamon mars, each with wooden lid. All jars are in perfect condition and lids have rubber stoppers. Rack can be mounted on a wall or placed on a shelf. Decorated in a lovely deep cobalt blue and with the classic 60s/70s Heirloom Design. All impressed Hornsea Heirloom to the base. Rack measures about 35.5 cm (14”) long, 4.5 cm (1 3/4”) wide and 4 cm (1 1/2”) high. Jars measure about 6.75 cm (2 1/2”) high including lid and 4 cm (1 1/2”) across at the base, 5 cm (2”) at the lid. Please feel free to ask any questions. It has an elongated body and has a green head and is decorated with green lines around the word 'GODSHILL'. This superb scarce Pig shaped money bank was produced by Hornsea Pottery during the 1960's/70's and was designed by John Clappison. HORNSEA SAFFRON TEA POT. GOOD STURDY TEA POT. Hornsea England Saffron Lidded Storage Jar container This is in very good condition with no cracks, chips or crazing that I can see. The lid has some fading on it. See photo. Size 11cm tall 11cm lid diameter Please see my other Hornsea saffron items for sale. Happy to combine postage. Hornsea Pottery Green Glaze Heirloom Mug, John Clappison Design. Qty Available. Hornsea Pottery Green Glaze Heirloom Pattern Mug. John Clappison Design. Qty Available. Attractive Mugs to extend an existing set. Perfect for Tea or Coffee. This is a Hornsea Saffron dessert / soup bowl. vintage Hornsea Pottery John Clappison 'The World's Best Lover' mug. very 1970s. wonderful, humourous thing. fully marked with usual backstamp. height approx. 9cm great overall condition, no damage - please see images any questions please ask HAPPY TO ADD AN INTERNATIONAL SHIPPING OPTION (especially if bidding on multiple items). please do get in touch for a quote, otherwise it will default to eBay's GSP service 😃 good luck! A very collectable Hornsea Mug from the mid 1970s. Base stamped - Hornsea, Bronte & England. The Classic BRONTE design from John Clappison. BRONTE MUG. Lovely and very collectable Hornsea Mug. Base stamped - Hornsea & England. A real classic design from John Clappison. A great mug from 1966 ( EARLY ) with a nice clean crisp base. Hornsea Pottery Heirloom Brown Tea Pot. this tea pot has never been used and is in mint condition this has probably just sat in a cabinet on display or at the back of a cupboard somewhere. Finding one in this condition is rare! They don't crop up often so this is the chance for you to grab an original mid century gem!! 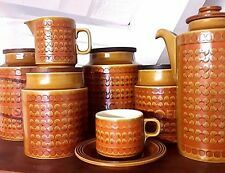 More hornsea available check my other listings. Hornsea Pottery Saffron Coffee Pot 3 Pints Vintage Retro British. Condition is Used. Dispatched with Royal Mail 2nd Class. A very collectable Large Hornsea Milk / Custard Jug. Base stamped - Hornsea, 1974 & England. The Classic BRONTE design from John Clappison. Large Custard Jug. You can buy new seals. Good condition, tiny chip on the spout and one to the lid. 4 side plates 16 cm diameter in excellent condition. A very collectable Hornsea Ceramic lidded pot. Base stamped - Hornsea, Bronte & England. The Classic BRONTE design from John Clappison. Lidded Sugar / Preserve Pot. From the mid 1970s. Super retro vintage Hornsea Bronte set of salt, pepper, and spice jars with wooden rack. Great vintage condition with no damage. See photos and please ask if any questions. Hornsea England Saffron Lidded Coffee Jar This is in very good condition with no cracks, chips or crazing that I can see. The lid has some fading on it. See photo. 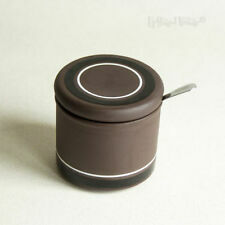 Size 15.5cm tall 11cm lid diameter Please see my other Hornsea saffron items for sale. Happy to combine postage. Stylised Relief Turquoise Pattern. Circa 1960's. Mark on Base. Collectable Hornsea Round Butter Dish. Base stamped - Hornsea, Saffron & England. The Classic SAFFRON design from John Clappison. A Round Butter Dish from the mid 1970s. TRADITIONAL HORNSEA DESIGN. KITCHEN STORAGE JAR. With this in mind they are carefully described and extensively photographed. Very Good - minor wear or rubbing attributable to light use. Excellent - very minor wear visible if any at all. A very collectable Hornsea Planter. Base stamped - Hornsea, 1976 & England. The Classic BRONTE design from John Clappison. The Planter collection was only produced in 1976. In excellent condition, I doubt if it has seen any use. 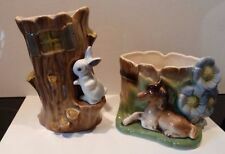 Approx Size :- 4.5" H.
From Hornsea Pottery. Set 4 white side plates. VERY RARE. FOR SIZE SEE PICS. The range was only produced in 1963 and was discontinued by the end of the year. Information given has been sourced from book: Hornsea Pottery 1949-1989 - its people, processes and products. Central green colour with rim decorated with coloured slip of black, coral pink, yellow and white. VINTAGE HORNSEA POTTERY SEASON OF MAY MUG, LANCASTER VITRAMIC, . Hornsea Pottery STUDIO SLIPWARE small round pin dish. Made during 1954-1957. This black dish is decorated with slip trails and dots of lemon yellow, duck egg blue and white. Hornsea studio art pottery Bead Curtain Pot. Designed by John Clappison and / or Jack Dadd in the 1970's. Stamped "Hornsea England 1976" to base. 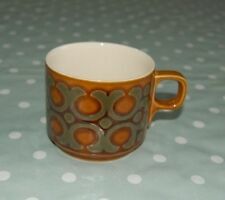 Vintage Hornsea Bronte Tea Cup. John Clappison. 1970's Qty Available. Hornsea Pottery 'Tapestry' Design Vinegar/Oil Jug. Mint Condition, 1970's.